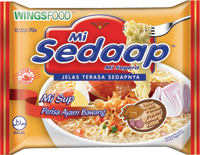 Mi Sedaap Goreng Asli flavor is everyone’s favourite. Its springy noodle with 5 times extra crunchy fried onions make you to enjoy every bite of it. 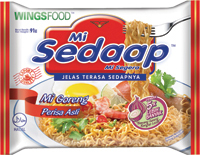 Mi Sedaap Goreng Asli is the pioneer in giving you the eating excitement with the crunchy and tasty fried onions. Its crunchy fried onions have the kriuk-kriuk sound in your mouth when you bite on it. You will be redirected to one of our partner sites. Please be sure to read their terms and conditions. 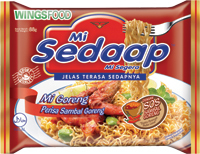 Mi Sedaap Sambal Goreng flavor is to cater to Malaysians that love spicy taste. It has extra sambal sauce that give a hot flavor while enjoying every bite of the noodle. 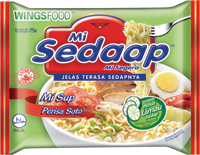 Mi Sedaap Sambal Goreng flavor has added in fresh lime juice in spicy sambal sauce to enhance taste. It gives a complete taste when you bite on each string of the noodle. Soto soup is originated from Indonesia. Malaysians would love something different and new from the common soup flavors that available in the market. Lime juice is added to the soup ingredients to give the soup a fresher taste and fresh smell to the consumers. The consumers will enjoy the noodle and the soup and not a single drop soto soup will leave behind. 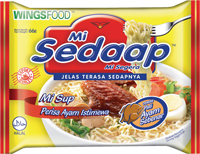 Mi Sedaap Ayam Bawang soup flavor is rich with fried onion chicken ingredient as the soup based. The rich aromatic onion chicken smell makes your stomach hunger for more. It’s not an ordinary onion chicken flavor compare with others. The flavor is simple irresistible! Mi Sedaap noodle with thick chicken flavor essence. It just tastes like an authentic bowl of chicken soup from home. Nothing is better with a bowl of instant noodle with authentic chicken flavor soup to make your stomach full and nutritional. Mi Sedaap Kari flavor is made with natural Kari spices that give you the authentic Kari taste like home-cooked curry. Mi Sedaap Kari delivers the “Real Kari”, an irresistible aromatic curry flavor and rich curry soup that given an enjoyable mouthful and memorable taste for you. From the mixture of nature spices ingredients, this is why its taste particular rich & tasty. Copyright © 2019 Gentle Supreme Sdn Bhd (497222-U). All rights reserved.